A woman of love, fortitude, and generosity, Ruth Van Mullen touched, moved and inspired many during her long resilient life. Ruth devoted each of her days to her family and cherished nothing more than watching her loved ones grow and capture their own dreams. Ruth was loved abundantly and cherished in the hearts of many. Though she will be sadly missed, her loving legacy will continue to live in the hearts of all who were blessed to know her. The 1920s were an age of dramatic social and political change. Post-war peace, a booming economy, rising wages for most Americans and falling consumer prices, resulted in a higher standard of living for most. Tremendous confidence, prosperity, and previously unknown comforts marked this roaring decade when a person’s success was largely determined by a person’s ability to identify their desires and their willingness to do the work to make them a reality. This vibrant decade grew even brighter when Jacob and Rena (Goeree) Vander Kuyl welcomed their daughter Ruth into their hearts and home on August 30, 1921. Growing up on the northwest side of Grand Rapids, Ruth’s childhood was rich in faith and family. While her father provided for the family with his work as a custodian for Grand Rapids Public Schools, her mother was a homemaker. The oldest of the Vander Kuyls' three children, Ruth was a natural caretaker who understood the value of hard work and the importance of family. 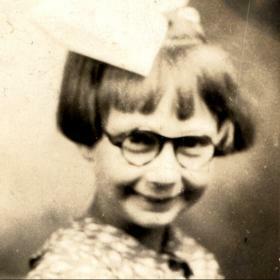 Along with her brothers, John and Leon, Ruth attended Harrison Park Elementary. Ruth left school after the 10th grade and worked as a nurses aid at Butterworth Hospital. Her family attended Seventh Reformed Church where she was very active in the youth group. In 1938, while attending the Christian Endeavor youth group, Ruth had the good fortune of being reintroduced to her childhood friend, Lawrence Van Mullen. Instantly smitten with one another, the two began to date and quickly fell in love. 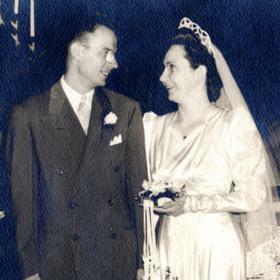 On August 26, 1943, the young couple united in marriage at Seventh Reformed Church in Grand Rapids. As their nuptials took place in the midst of WWII, rations on gasoline made it challenging to plan a honeymoon. Fortunately, Larry's good friend Jay Postumus, who worked as an undertaker in Grandville, gifted the newlyweds with a few extra coupons for gas rations enabling them to spend three beautiful days together in Holland, Michigan. After returning from their honeymoon, the couple moved into an apartment above Ruth’s parent's home where they would live for the next several years. As the war raged on and the country needed more soldiers, Larry was called to service. Just two months into their marriage, Larry left home for the Army. Fortunately, upon receiving an honorable discharge on June 16, 1944, Larry safely returned home to his bride. Not long after, Ruth and Larry were blessed to welcome their first child, Larry who was born in October of 1946. They were later blessed to welcome their daughter Janice in 1951, and son Dan completed their family in 1954. 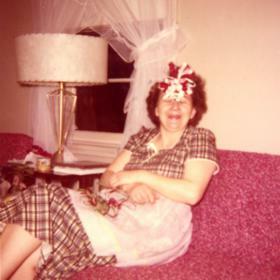 Ruth relished in motherhood, while Larry worked as a draftsman, Ruth joyfully ran the home. As their family grew, so did their need for a larger home. 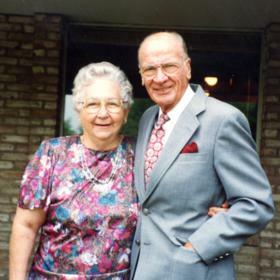 In 1951 Ruth and Larry built a home on Wilson NW where they would raise their family. A natural homemaker, Ruth kept a meticulous home. The rock upon which the family was built, she ensured that everyone was cared for and she loved to cook. Her roasts, chicken, and fish were wonderful, and her delicious breads, cakes, and pies were unrivaled. Ruth and Larry centered their family values in their faith which they continued to explore and celebrate through their charter membership at Remembrance Reformed Church in 1958. The family also enjoyed taking family trips together. Some of the most memorable included traveling out west, down to Kentucky and Tennessee. As the children grew and eventually left home, Ruth and Larry continued traveling by car, eventually visiting all 48 states. . In their retirement years they explored many National Parks and spent many summers in Nova Scotia and winters in Brownsville, Texas. When home, Ruth enjoyed watching the birds at her bird feeder, listening to Christian music--especially the old hymns, and watching a little TV. A couple of her favorites were The Waltons and Little House on the Prairie. Even though she never played the game herself, Ruth also and loved to watch Golf on TV. Ruth also volunteered much of her time and talents to their church community over the years. 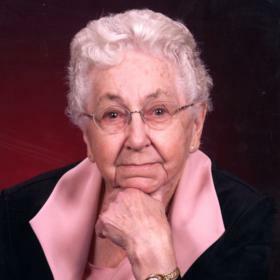 She was very active in the Women’s Guild, Sunday school, Wednesday night dinners, Sunday coffee, mother-daughter and father-son dinners, and so much more. If there was food to be cooked, you could count on Ruth to be in the kitchen working her magic. 34 years ago, Dan and his wife Dory invited Ruth and Larry to move to Sparta and live with them in the in-law apartment in their home. For many years they enjoyed the day to day pleasures of watching their grandchildren grow and sharing daily life with each other. Ruth loved being a grandma and was thrilled to become a great-grandma in 2001 and now has a total of 8 great grandchildren. She was incredibly loving and supportive and never missed a birthday or any other special days. In November of 2006, Larry went home to glory in the arms of Jesus. After 63 years of sharing every day together, the loss was tremendous. Leaning into her family, faith, and church community, Ruth did the hard work of learning to live in the absence of her beloved. She continued to read the Bible each day and also found comfort in reading books and knitting items to donate to the missions. She attended Sunday services and chose to concentrate on her blessings. Life went on, and so did Ruth. 2017 brought the unfortunate diagnoses of lymphoma and sarcoma. With a strong will to fight the diseases, she had several radiation treatments which went well for her. Despite the treatments going well, Ruth was enrolled in Faith Hospice last February and chose to move to Christian Rest Home. Here she received loving care from a dedicated staff. With their great care, Ruth was able to continue reading and knitting until just a couple weeks ago. It is difficult to imagine life in the absence of Ruth’s steadfast love and presence. May it afford deep comfort to know that with each homemade cake we bake, road trip we take, and family gathering we enjoy, we are living the best of Ruth’s legacy in our own lives. In this way, her beautiful spirit will continue to warm our hearts and inspire a smile for many years to come.